I eat at least one banana and one apple every. single. day. Since I also drink a smoothie almost every single day, I thought these two fruits would pair so well together in a creamy smoothie with some superfoods for health, energy, and protein. In this smoothie I use maca powder. This is a new product that I have been taking daily. I usually mix it in to smoothies or oatmeal. What is maca? It is a root that is grown in the Andes mountains of Peru and is packed full of nutrition. I actually began using it because I heard it could help balance hormones. I’ve only been using it for about a week so I haven’t been able to see if it has been helping yet. One thing I have noticed though, is the great boost of energy! I also love all the nutrients that I get from taking maca; tons of vitamins (like B-12), minerals, enzymes, and all the essential amino acids. You can buy two different forms of maca: raw or gelatinized (which is a little more expensive) but I bought the gelatinized because I heard it is easier to digest than the raw maca. Considering I have a very sensitive stomach, I thought it would be worth the few extra dollars. To read more about maca and its benefits click here. 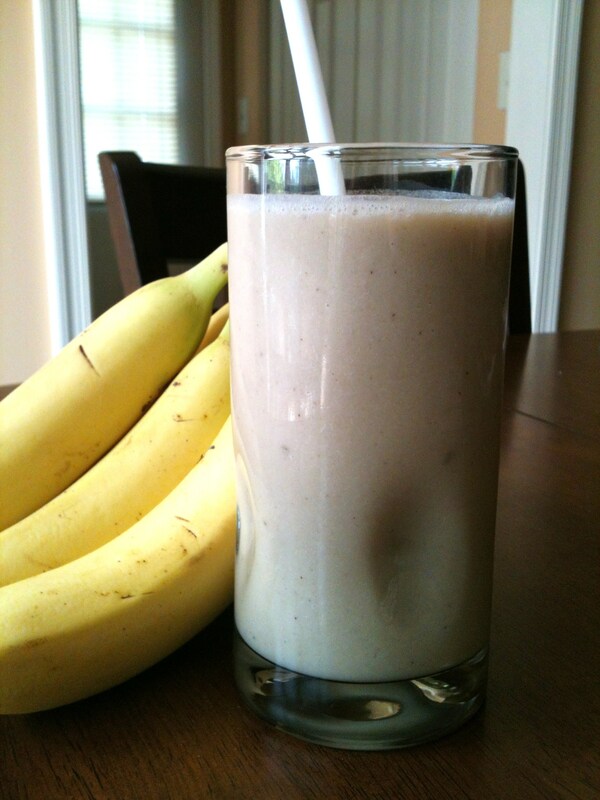 If you want a thicker smoothie add a whole frozen banana and/or decrease almond milk to 1/2 cup. You can also add 1/2 cup ice cubes if you want an icier smoothie. If you don’t have maca powder, you can omit it. Maybe add in some other superfood like hemp hearts (these would even be great as a topping), flax seeds, chia seeds, almonds, or even spinach for a green smoothie! And if you are interested in buying maca, you can purchase it at iherb with my code LWZ362 for a discount on your first purchase! This recipe yields approximately 300 calories and 10.5g protein. 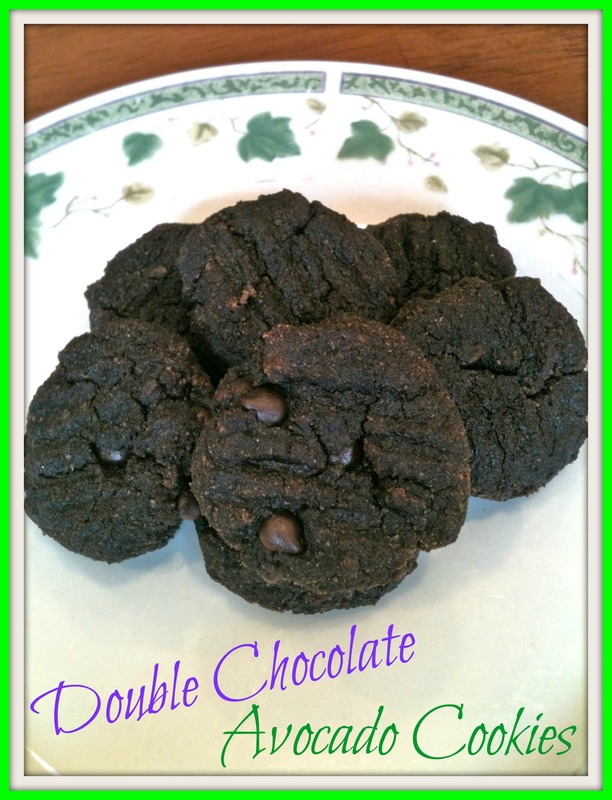 Yesterday, I posted the recipe for the Double Chocolate Avocado Cookies. Today, we are changing the recipe up a little and including some peanut butter! Preheat oven to 350F and line a baking pan with parchment paper. In a bowl, combine avocado, peanut butter, the flax egg, and agave and mix together. Roll the dough into balls (about the size of 1 tbsp) and place each on the prepared baking pan. These taste just like a peanut butter cookie except with some secret healthy ingredients! I made 23 cookies. I am roughly estimating that each cookie yields approximately 70 calories and 2g protein. Chocolate and avocado… Do I even need to say more? Wait, actually I do. 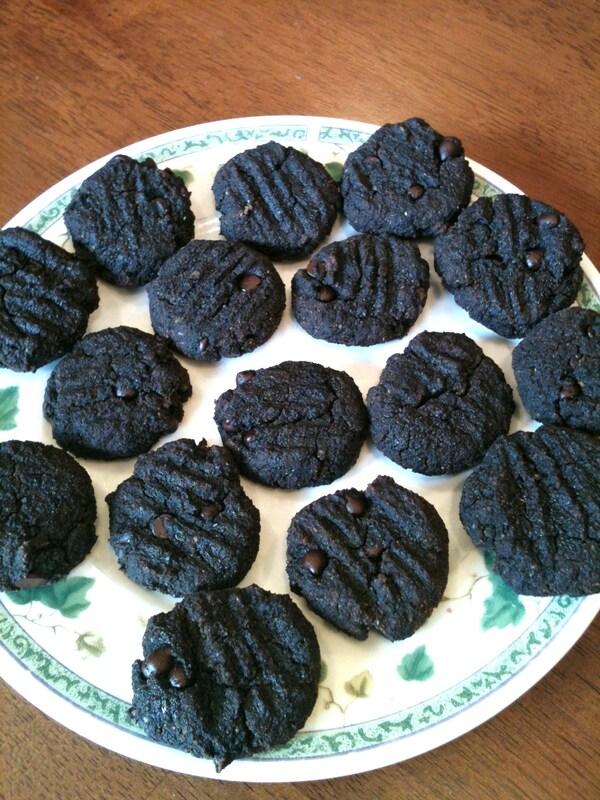 When I came across the recipe for these cookies, I thought I was in heaven. 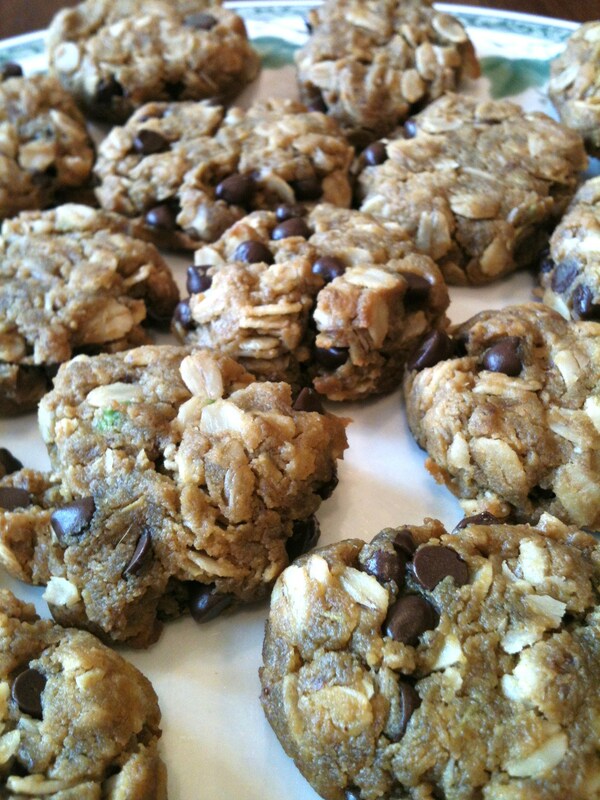 But then I found these Chocolate Avocado Cookies were based on another cookie that included Peanut Butter! Peanut butter, chocolate chips, and avocado!!! Obviously I couldn’t decide which cookies to make first. Since I am on a holiday for Memorial Day I decided to make both! 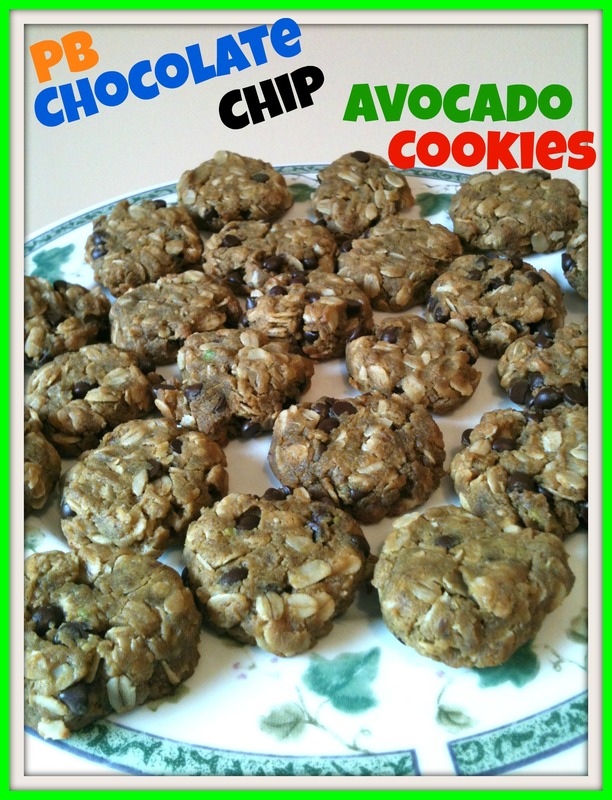 Today I will post the recipe for the Chocolate Avocado Cookies and tomorrow I will post the recipe for the Peanut Butter Chocolate Chip Avocado Cookies! Preheat oven to 375F and line a baking pan with parchment paper. In a large bowl, combine almond milk, flax eggs, and vanilla extract, avocado, and agave and mix with a fork. In a small bowl, combine all other ingredients except the chocolate chips and mix together. Roll the dough into small cookies (about the size of a tablespoon) and place on prepared baking pan. Gently flatten each ball with a fork. These cookies were amazing! They held together perfectly, but were still incredibly soft. I have always loved soft cookies over crunchy cookies! I made 21 cookies. I am roughly estimating that each cookie yields approximately 35 calories and .5g protein. I love the combination of pistachios with sweet fruits, especially cherries! Unfortunately, I didn’t have any cherries but I did have some strawberries and that sounded just as great a combination! This was a super sweet smoothie with the perfect nutty taste. Combine all other ingredients and blend until smooth and creamy. 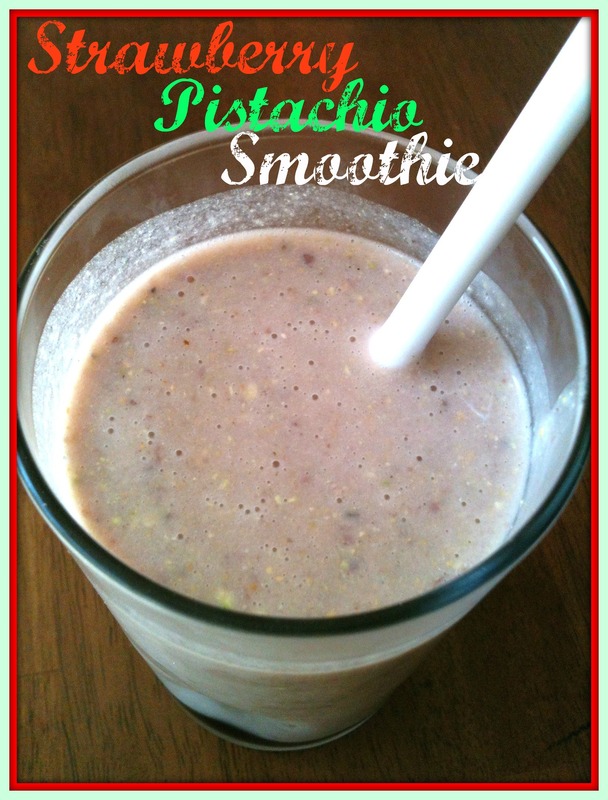 Chocolate Strawberry Pistachio Smoothie – Use a chocolate flavored protein powder or 1 tbsp cocoa powder. 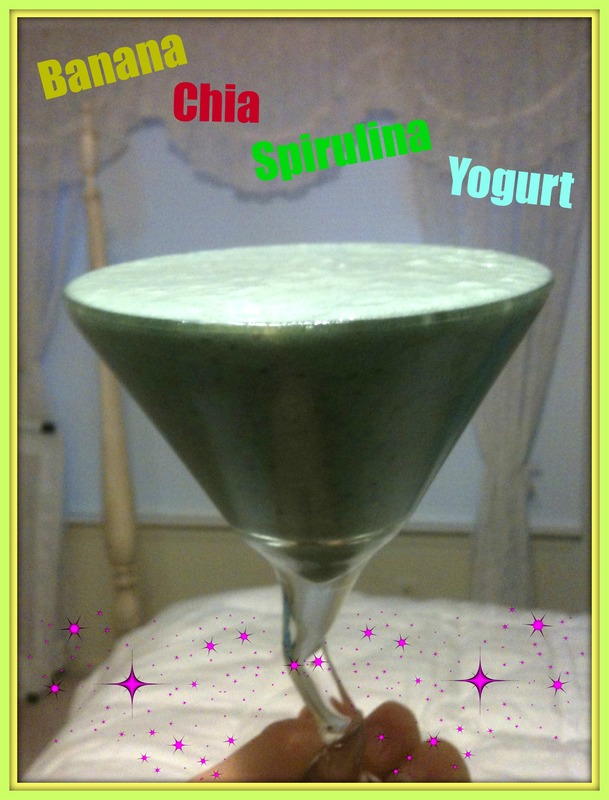 Green Strawberry Pistachio Smoothie – Add a handful of spinach or 1 tsp Spirulina. I think next time I might try adding spinach! With all these ingredients, this would be a perfect post-workout smoothie! 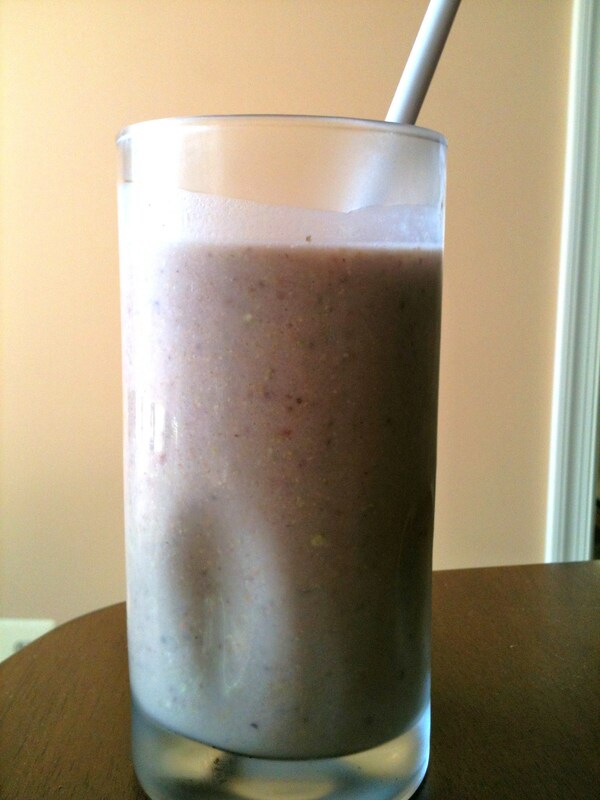 This smoothie, including the protein powder, yields approximately 300 calories and 13g protein. I love waffles on Sunday mornings! Today, I was really feeling indulgent and made my original buckwheat waffle but added some ingredients to make them Chocolate Strawberry flavored. I even added banana which really made them Chocolate Strawberry Banana waffles. No, actually…I topped them with almond butter, so really they were Chocolate Strawberry Banana with Almond Butter! 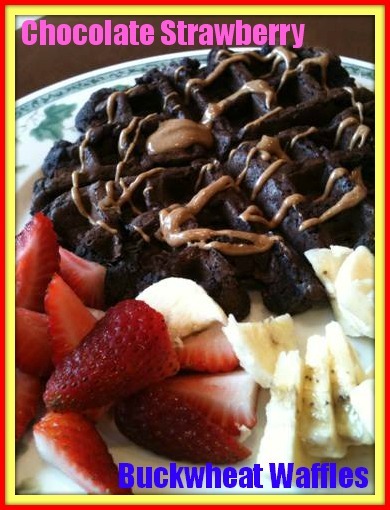 Check out my original buckwheat waffles here and scroll down to the bottom to make the more indulgent Chocolate Strawberry Buckwheat Waffle! 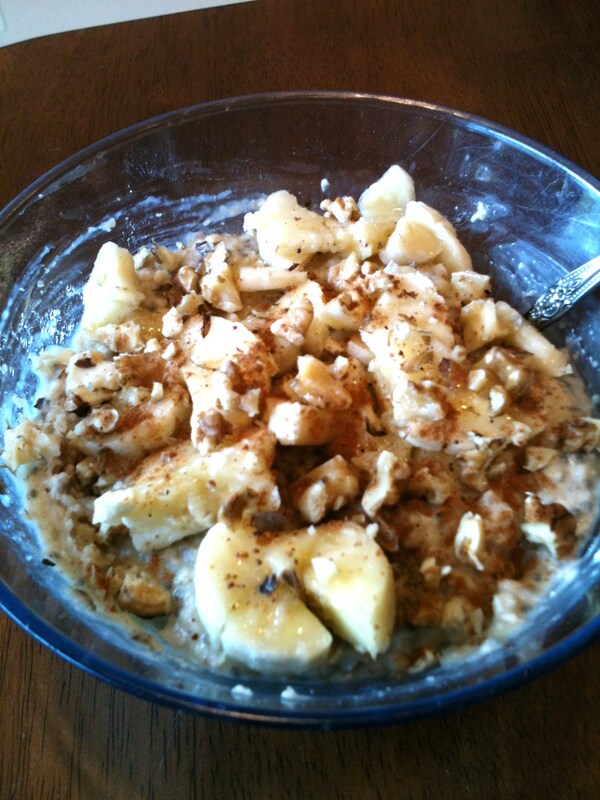 I absolutely love bananas in my oatmeal for breakfast. No matter what I mix into the oatmeal, there is always at least 1/2 a banana. 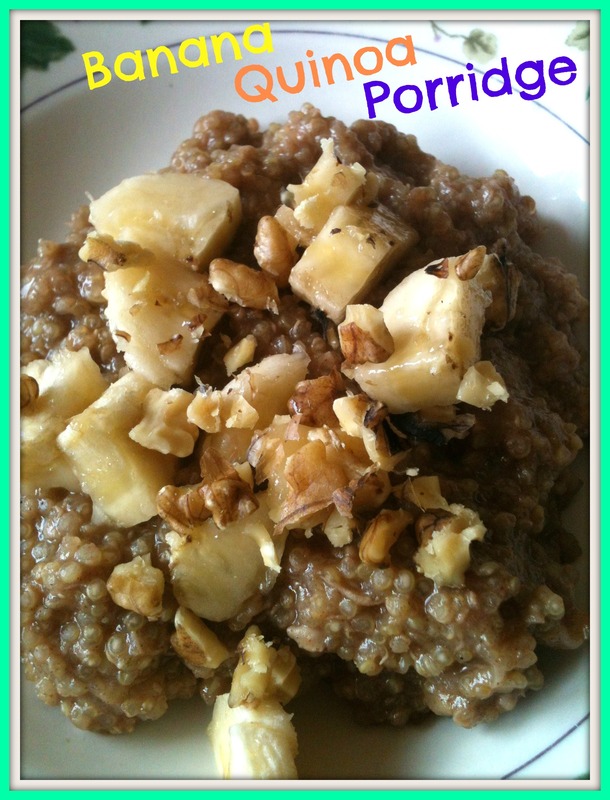 I’ve tried several different combinations with banana oatmeal like peanut butter (the best! ), almond yogurt, vanilla protein powder, a combination of all three of those with the banana oatmeal, sometimes I even add in chia, flax, and/or hemp seeds, or different nuts and seeds like peanuts, almonds, walnuts, or pepitas, and other times I’ll add different fruits like strawberries or apples. But the one thing that stays the same is there is always that banana. It just adds the perfect sweetness, the perfect nutrition, and adds more volume to the oats. Last night I knew I wanted to have oatmeal in the morning (I always prepare my oats overnight so that it is ready to go in the morning and the oats can really soak in the almond milk) but I wanted to try a new way to have oatmeal with a banana. I went on Google to get some ideas and came across a recipe that sounded amazing. 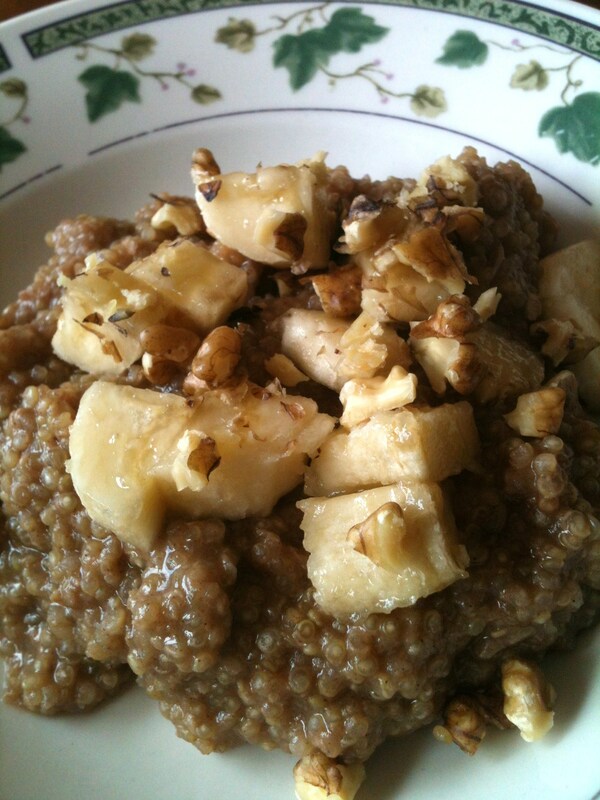 The original recipe used steel-cut oats and blended them up so they wouldn’t take as long to cook. However, I didn’t have steel-cut oats so I was just going to make it with rolled oats…but then I wondered what it would be like if I blended the rolled oats first. Let’s just say I think from now on ALL my oatmeal bowls will not only include a banana, but the oats will be blended too! Pour oats and chia seeds into a bowl. Add all other ingredients except the banana and walnuts. *I like thick oatmeal and this oatmeal was extremely thick. If you would prefer a less thick oatmeal you can add 1 cup almond milk instead of 3/4 cup. Or just add extra almond milk in the morning to thin it out if the oatmeal is too thick for your liking after soaking in the oats all night. This oatmeal recipe tastes just like banana bread! 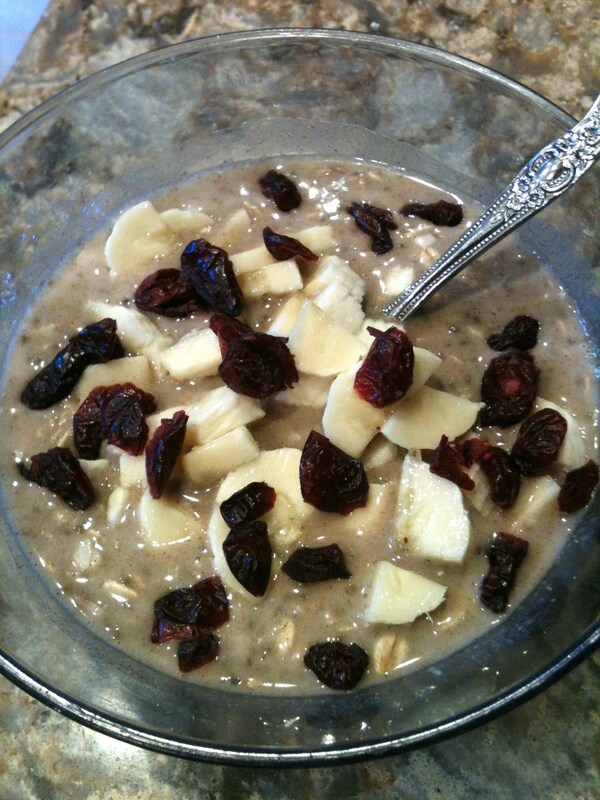 In the morning I heated my oatmeal before mixing in the 1/2 mashed banana for easier mixing. 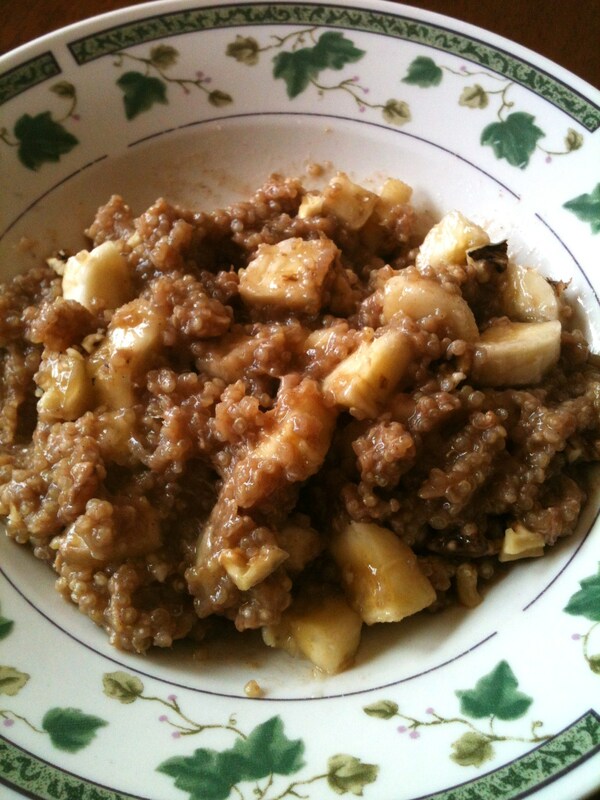 I then topped it with the other 1/2 of the banana, walnuts, extra cinnamon, extra nutmeg, and extra maple syrup. I really had a sweet tooth this morning! Oh, and one more note. The original recipe also calls for raisins. I didn’t have any, but when I buy some more I’ll definitely add a few to the oatmeal, I’m sure they would be delicious! Based on using Trader Joe’s GF Rolled Oats and original Silk PureAlmond Milk, this recipe yields approximately 405 calories and 11g protein. I debated between calling this a yogurt or a smoothie in a bowl. Even though it can be a smoothie, it was really thick so it needs to be eaten out of a bowl like yogurt. Usually, when I eat a smoothie in a bowl I add additional toppings. Since I didn’t add additional toppings, I think this is more like a recipe for a yogurt base. If you add additional toppings you can call it a yogurt bowl or a smoothie in a bowl since it is so thick. In fact, I think next time I will definitely add banana slices, almonds or walnuts, and maybe even hemp seeds on top for more texture and more of a filling breakfast. Directions: Combine all ingredients in a blender and blend until smooth and creamy. Pour into a bowl and add additional toppings if desired. *If you don’t have spirulina, you can omit, but I suggest using a small handful of spinach for added nutrition. This yogurt is great for breakfast if you add those additional toppings for a more filling and satisfying meal! 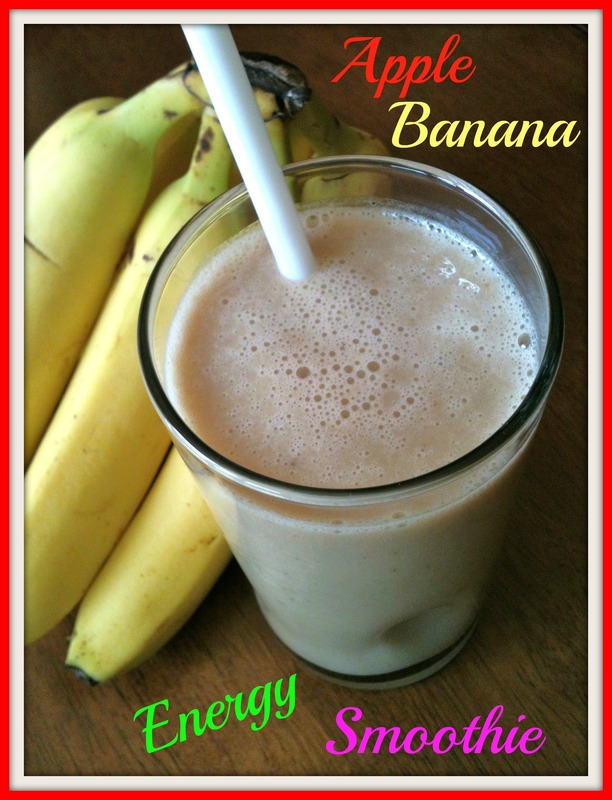 The spirulina is a great energy boost and the banana will give you additional energy and nutrition as well! This recipe yields approximately 255 calories and 6.5g protein. Over the winter months, I eat oatmeal for breakfast almost every single morning. I love a warm bowl of oatmeal to start my morning when I wake up freezing! During the summer months, I still eat a good amount of oatmeal for breakfast, but it is usually eaten cold. However, sometimes I like to change it up and use a different grain. For this breakfast, I decided to use quinoa. Quinoa is a great breakfast grain because it is high in protein and, similar to oatmeal, it tastes great whether eaten hot or cold. And even though I changed up the main grain for my breakfast, I still left in my favorite fruit…banana! 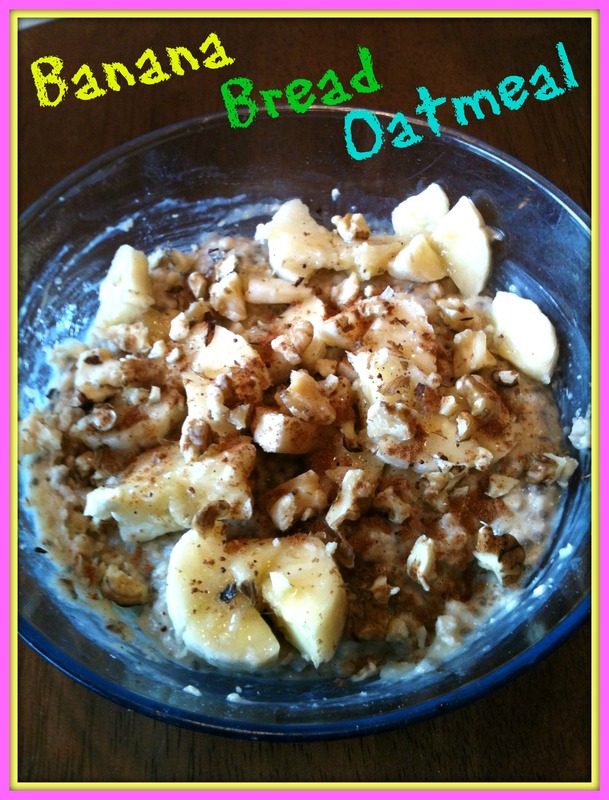 Almost all of my oatmeal recipes I mash in at least half a banana for sweetness, extra creaminess, and extra volume! Combine all ingredients in a medium-sized pan. Bring to a boil, covered. Once boiling, reduce heat and allow to simmer, covered, for about 15 minutes or until all liquid has been absorbed, stirring occasionally. Pour into a bowl, top with the rest of the banana, sliced, and additional walnuts, if desired. The original recipe also calls for raisins, which I didn’t add to my breakfast but I’m sure would taste great! Also, the original recipe uses half almond milk and half water. I used all almond milk because I wanted this breakfast as creamy as possible. You can do whatever works best for you, as long as you double the amount of liquid for the amount of quinoa. I also only made this for myself so I only wanted one serving, but you can easily double this recipe for more than one person or if want to make extra so you have breakfast for yourself two days in a row! This recipe, with the other 1/2 sliced banana topping, yields approximately 435 calories and 9g protein. In honor of this holiday, I thought I would post my recipe for one of my favorite meals when I am in the mood for Mexican food. In a bowl, chop or mash the sweet potato. 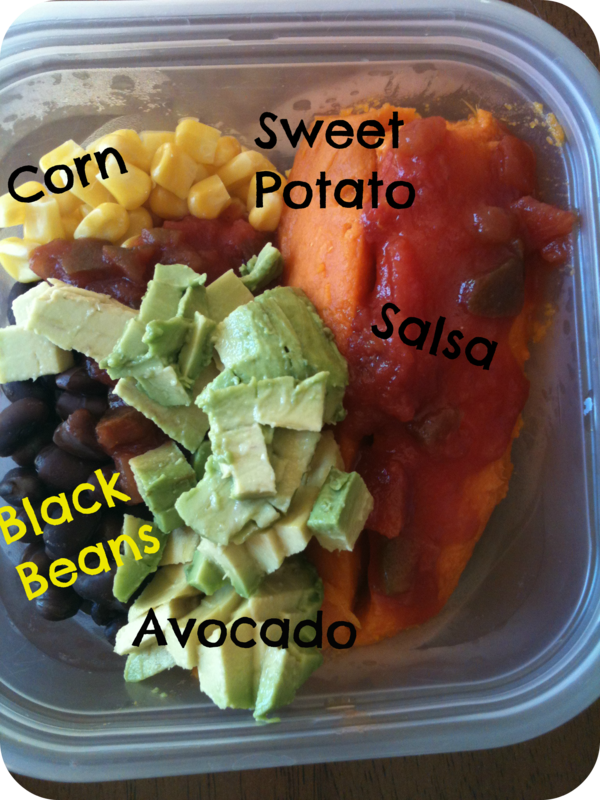 Add black beans, corn, avocado, and salsa on top of sweet potato. Warm in the microwave, if desired, and enjoy! 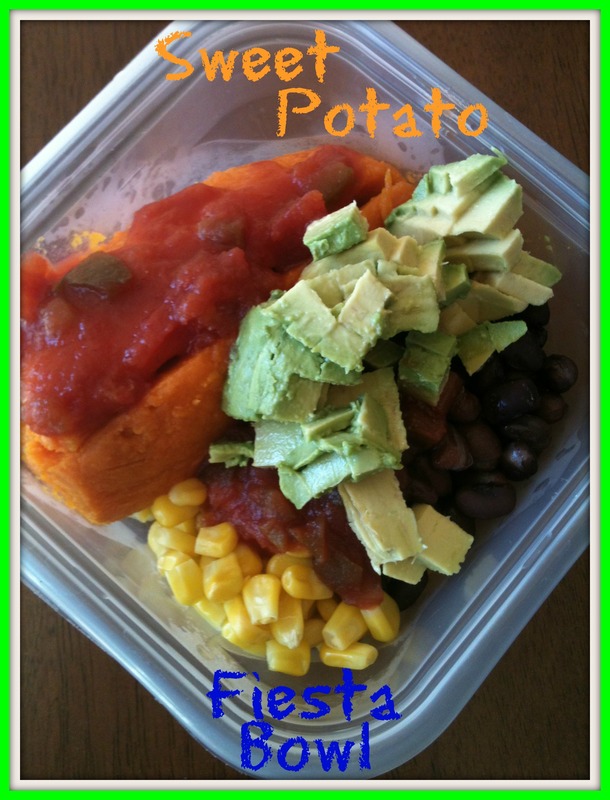 This is a very simple meal and it is one of my favorites! I eat this a lot since it is so easy to make. I don’t really measure out how much of everything I use, but I am guessing this is about how much of each ingredient I use each time I make this meal. Of course, you can add more of any ingredient you like the most and less of others, add different vegetables or beans (I’ve used chickpeas before! ), you can even add some plain greek yogurt on top as a substitute for sour cream (I recommend So Delicious Greek Almond Yogurt). After I add everything in a bowl, I mix it all together. 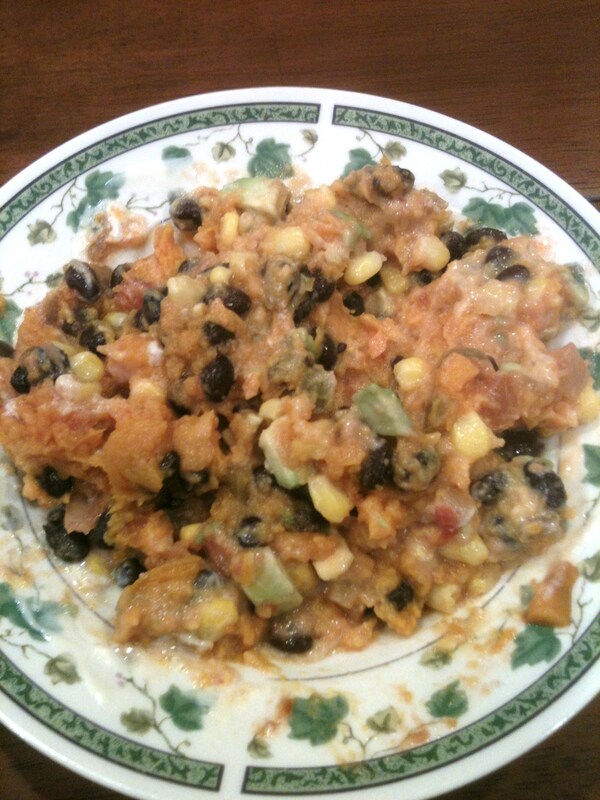 After mixing it all together, it doesn’t look as pretty but it definitely tastes great! I added plain greek yogurt to this bowl! Yeah, much better looking before it is mixed all together! Another option is to turn this into a wrap! 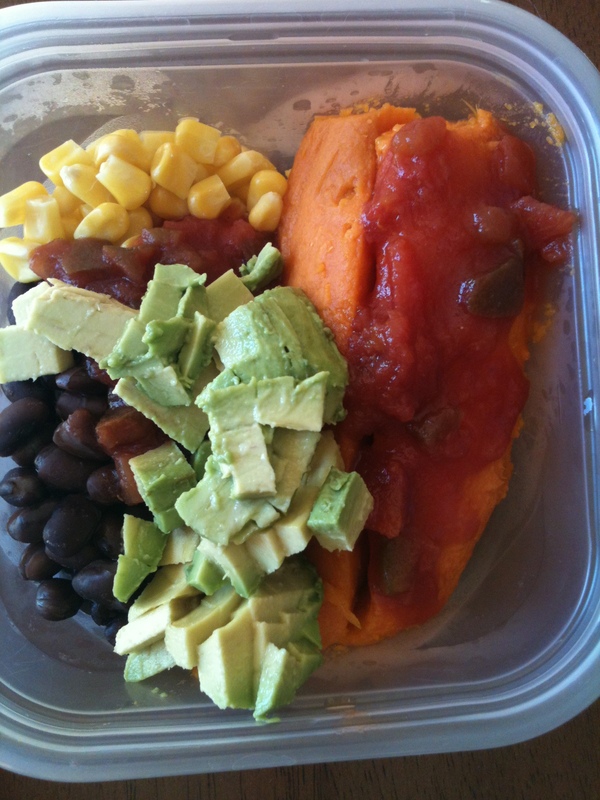 Omit the sweet potato and use a brown rice tortilla to wrap all the ingredients together. 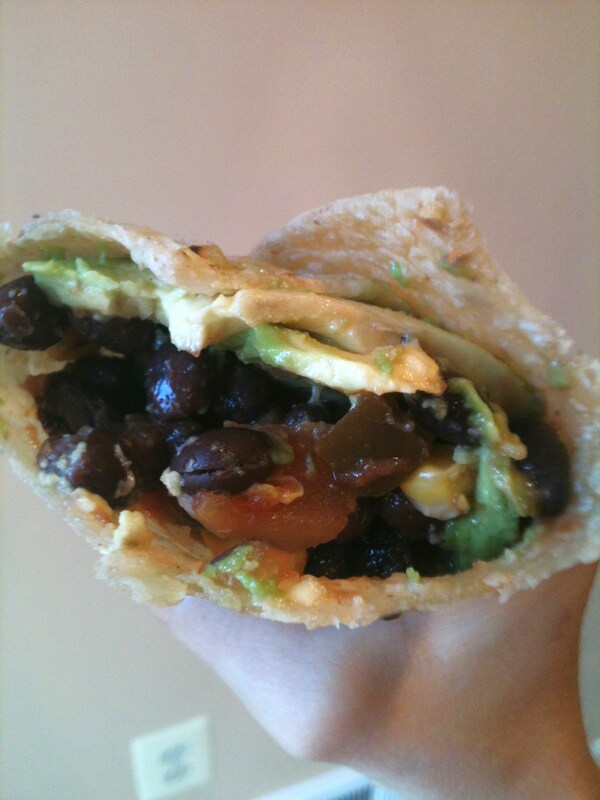 Simply mix the black beans, salsa, and corn in a bowl; spoon the mixture onto a tortilla; top with sliced avocado; and wrap it all together! I am not the biggest fan of cereals. However, I do love when cereals have tons of healthy ingredients mixed together, almost like a trail mix. 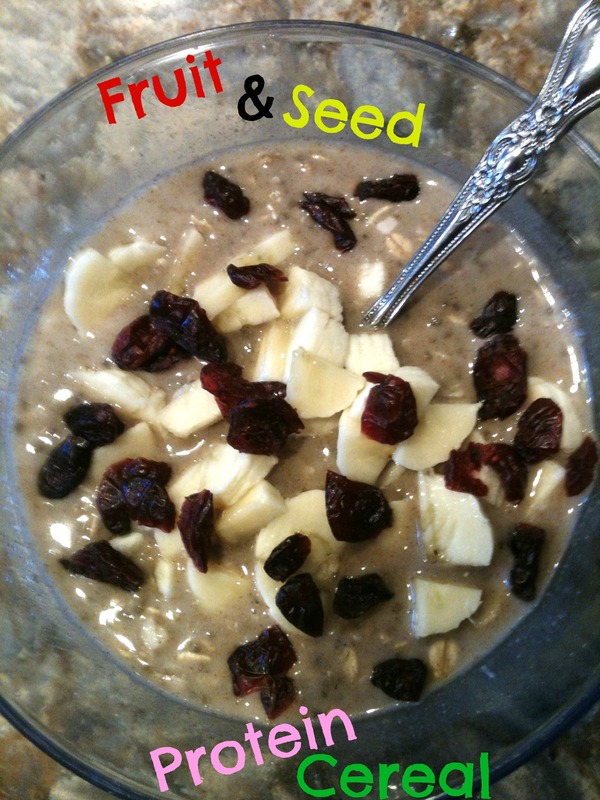 When I came across this recipe for a cereal with tons of superfoods, I knew I needed to give it a try. The base of this cereal is oats, so I guess technically it is still more similar to oatmeal than “cereal”, but since I normally prepare my oatmeal the night before so it is soft in the morning and eat that warmed in the microwave, this cereal does not soak oats over night so the oats have a good bite to them more typical of a cereal and they are eaten cold with almond milk poured freshly on top of the oats, seeds, and fruit before enjoying! Pour almond milk over dry ingredients and top with sliced banana. This breakfast is super easy to prepare (especially if you mix together the dry ingredients the night before), filling, and filled with healthy nutrients! This will be a perfect breakfast very soon on hot summer mornings! Based on using Trader Joe’s GF Rolled Oats, Sunwarrior Raw Blend Vanilla Protein Powder, and original Silk PureAlmond Milk, this recipe yields approximately 410 calories and 17.5g protein.